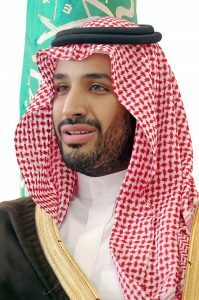 Saudi Crown Prince backs Israel’s right to territory and promotes need for a peace agreement: Could he be the “prince” of Daniel 9:26-27? « Could Jesus really have been resurrected on a Sunday? Israel has a “right” to a homeland alongside the Palestinians, Saudi Arabia’s influential crown prince, Mohammed bin Salman, said on Monday in an interview with US magazine The Atlantic. Riyadh has sponsored an initiative supporting a two-state solution to the Israeli-Palestinian conflict since 2002, but Salman is the first senior official to explicitly acknowledge Israel’s right to any territory in the region. Saudi Arabia does not officially recognize Israel and has said any normalization of relations requires Israel to withdraw its claim to Palestinian territory seized during the 1967 Arab-Israeli war. Crown Prince Mohammed bin Salman recently also made statements committing to interfaith tolerance (see Saudi Crown Prince ‘commits to interfaith tolerance’). Long time readers of this COGwriter Church of God News page are aware that I have written for years that some type of temporary deal will be struck between an Arab leader and a European one (Daniel 11:27), but also there will be a ‘peace deal’ in the Middle East (Thiel B. 2012 and the Rise of the Secret Sect. Nazarene Books, 2009). The above is referring to a deal or covenant that has a time element attached to it. The “week” is generally understood to be referring to a seven-year period of time. Notice a “prince” is to be involved from the people who destroyed the Temple (which happened in 70 A.D.). The above sounds similar to the seven year (one week in biblical language) agreement discussed in Daniel 9:27 that involves a European “prince” who appears to be the one the Bible warns will become the King of the North and apparently the nation of Israel (for proof this is a European, check out the video Can You Prove that the Beast to Come is European?). It certainly would make sense that there would be Muslim representation in a peace deal. A temporary ‘peace deal’ will come to the Middle East. Why is the prophecy in Daniel 9:27 believed to be a type of ‘peace deal’? So this leader gives people the impression that there will be “peace” and is involved in some type of deal. This is the same leader that confirms the covenant in Daniel 9:27. The term translated as “peace” in Daniel 8:25 is from the Hebrew term shalvah and essentially means security. In other words, this leader will destroy “many” who are under the impression that they are secure because of some type of security and/or trade arrangement. Such arrangements are now commonly referred to as peace deals or treaties. Since the prophesied deal has not been confirmed, at least not publicly, the Great Tribulation would seem to be at least 3 1/2 years away (you may also wish to watch a YouTube video Can the Great Tribulation begin before 2020? A shorter video is: Can the Great Tribulation begin in 2018?). Who destroyed the Temple in A.D. 70? The Temple was destroyed by the forces of Rome, but, interestingly, according to the historian Josephus, not at the command of Rome or the people of Rome. Did you know that? You do now. By A.D. 70 the Roman armies in the Middle East were made up largely of men who were not from Europe, not from Italy. They were comprised of provincial soldiers from Syria, Arabia – local forces. While they were under the command of Roman officers, they were not ordered to destroy the Temple. In fact, they were ordered to stop the destruction by Titus, who would later become emperor. First let me quote from the Roman historian Tacitus who meticulously described the forces that sacked Jerusalem and destroyed the Temple. So, while there were Arabs, they were only part of the conquering force, and there were many brought from Italy and Rome. Presuming the above is correct, then in the first century, the vast bulk of the soldiers were Roman citizens. Most of which would have been ethnically European (Italian, Greek, etc.). Finally, after the Romans and these Middle Eastern provincial forces of Rome broke through the city walls and captured the Temple, it was set on fire. In other words, Titus had no desire to see the Temple destroyed. Rome loved its treasures of conquest, and this Temple was one of the greatest prizes ever. The emperor’s son didn’t order the Temple destroyed. He tried desperately to stop it. Now, although it is true that Titus himself preferred to not destroy the Temple and the above seems to support Joseph Farah’s view of Arab destruction, this is only partially what Josephus wrote. 5. So Titus retired into the tower of Antonia, and resolved to storm the temple the next day, early in the morning, with his whole army, and to encamp round about the holy house. But as for that house, God had, for certain, long ago doomed it to the fire; and now that fatal day was come, according to the revolution of ages; it was the tenth day of the month Lous, [Ab,] upon which it was formerly burnt by the king of Babylon; although these flames took their rise from the Jews themselves, and were occasioned by them; for upon Titus’s retiring, the seditious lay still for a little while, and then attacked the Romans again, when those that guarded the holy house fought with those that quenched the fire that was burning the inner [court of the] temple; but these Romans put the Jews to flight, and proceeded as far as the holy house itself. At which time one of the soldiers, without staying for any orders, and without any concern or dread upon him at so great an undertaking, and being hurried on by a certain divine fury, snatched somewhat out of the materials that were on fire, and being lifted up by another soldier, he set fire to a golden window, through which there was a passage to the rooms that were round about the holy house, on the north side of it. As the flames went upward, the Jews made a great clamor, such as so mighty an affliction required, and ran together to prevent it; and now they spared not their lives any longer, nor suffered any thing to restrain their force, since that holy house was perishing, for whose sake it was that they kept such a guard about it. 6. And now a certain person came running to Titus, and told him of this fire, as he was resting himself in his tent after the last battle; whereupon he rose up in great haste, and, as he was, ran to the holy house, in order to have a stop put to the fire; after him followed all his commanders, and after them followed the several legions, in great astonishment; so there was a great clamor and tumult raised, as was natural upon the disorderly motion of so great an army. Then did Caesar, both by calling to the soldiers that were fighting, with a loud voice, and by giving a signal to them with his right hand, order them to quench the fire. But they did not hear what he said, though he spake so loud, having their ears already dimmed by a greater noise another way; nor did they attend to the signal he made with his hand neither, as still some of them were distracted with fighting, and others with passion. But as for the legions that came running thither, neither any persuasions nor any threatenings could restrain their violence, but each one’s own passion was his commander at this time; and as they were crowding into the temple together, many of them were trampled on by one another, while a great number fell among the ruins of the cloisters, which were still hot and smoking, and were destroyed in the same miserable way with those whom they had conquered; and when they were come near the holy house, they made as if they did not so much as hear Caesar’s orders to the contrary; but they encouraged those that were before them to set it on fire. As for the seditious, they were in too great distress already to afford their assistance [towards quenching the fire]; they were every where slain, and every where beaten; and as for a great part of the people, they were weak and without arms, and had their throats cut wherever they were caught. Now round about the altar lay dead bodies heaped one upon another, as at the steps going up to it ran a great quantity of their blood, whither also the dead bodies that were slain above [on the altar] fell down. 7. And now, since Caesar was no way able to restrain the enthusiastic fury of the soldiers, and the fire proceeded on more and more, he went into the holy place of the temple, with his commanders, and saw it, with what was in it, which he found to be far superior to what the relations of foreigners contained, and not inferior to what we ourselves boasted of and believed about it. But as the flame had not as yet reached to its inward parts, but was still consuming the rooms that were about the holy house, and Titus supposing what the fact was, that the house itself might yet he saved, he came in haste and endeavored to persuade the soldiers to quench the fire, and gave order to Liberalius the centurion, and one of those spearmen that were about him, to beat the soldiers that were refractory with their staves, and to restrain them; yet were their passions too hard for the regards they had for Caesar, and the dread they had of him who forbade them, as was their hatred of the Jews, and a certain vehement inclination to fight them, too hard for them also. Moreover, the hope of plunder induced many to go on, as having this opinion, that all the places within were full of money, and as seeing that all round about it was made of gold. And besides, one of those that went into the place prevented Caesar, when he ran so hastily out to restrain the soldiers, and threw the fire upon the hinges of the gate, in the dark; whereby the flame burst out from within the holy house itself immediately, when the commanders retired, and Caesar with them, and when nobody any longer forbade those that were without to set fire to it. And thus was the holy house burnt down, without Caesar’s approbation. So, Titus did not want to destroy the Temple, but he and his troops did so. Why is it today that so many Christians believe that the future Antichrist will be from Europe, from a revived Roman Empire? “The people of the prince that shall come shall destroy the city and the sanctuary.” The prince that shall come is the Antichrist. So, naturally, many have concluded that since Rome destroyed the Temple, a Roman prince would have to be the Antichrist. Yet, Roman authority did not seek to destroy the Temple. It sought to avert it. And the people who destroyed it were not Romans either. They were Arabs whose anti-Israel passions were inflamed. They even disobeyed direct orders from Rome to stop the destruction. Now, who did Josephus claim destroyed the city? It is not that Arabs had nothing to do with it, but they were not the initiators and of themselves did not destroy the city–the Romans did. The Roman army fulfilled Daniel 9:26. Get Joel Richardson’s groundbreaking New York Times best-seller, “The Islamic Antichrist,” for the full, comprehensive case. Just because a book may be a best seller, does not mean that it is accurate (remember The Da Vinci Code?). Regular readers of the COGwriter Church of God News page are aware that I have dispelled many of the errors of Joel Richardson and that book. Let’s also dispel a few more. The use by Joseph Farah of Daniel 9:26, of necessity, ties in with Daniel 11:31 and subsequent verses (see also Who is the King of the North?). Joel Richardson and Joseph Farah would seemingly agree with the tie of Daniel 9:26 and Daniel 11:31, etc. But the 11th chapter of Daniel is also problematic for the view that the final Antichrist power is Islamic. Daniel 11:39 tells of the King of the North destroying the strongest fortresses. This King is the one referred to as a prince in Daniel 9:26. In the 21st century, that would be the King of the North destroying the USA as it has the strongest military forces (for more details, see USA in Prophecy: The Strongest Fortresses). Notice that the King of the North is prophesied to destroy what are now predominantly Islamic regions of the Middle East and North Africa. While the King of the South would seemingly have to be Islamic (perhaps called a Mahdi), that is not the case for the King of the North. a time of doom fora the nations. Please realize that the Egyptians did not learn that the God of the Bible was Lord back then. Ezekiel 30 is referring to a time when the end time King of Babylon, the European King of the North, will destroy Egypt and its allies. Those allies are the predominantly Islamic peoples of North Africa and the Middle East, including the Arabs. Thus, it is not logical to conclude that the King of the North, who Joel Richardson and Joseph Farah are identifying as the final Antichrist, is an Islamic power based in Saudi Arabia (Joel Richardson and others have claimed that Mystery Babylon is the Saudi city of Mecca; watch also the video Mystery Babylon USA, Mecca, or Rome?). Perhaps I should add that while I do believe that the final King of the South will be anti-Jesus, biblically, there is no way that the final Antichrist will be an Arabic Islamic leader. The Bible does NOT support the view that the final Antichrist is an Islamic Arab. Much more information about why that is so is in the article Can the Final Antichrist be Islamic? 40 At the time of the end the king of the South shall attack him; and the king of the North shall come against him like a whirlwind, with chariots, horsemen, and with many ships; and he shall enter the countries, overwhelm them, and pass through. 41 He shall also enter the Glorious Land, and many countries shall be overthrown; but these shall escape from his hand: Edom, Moab, and the prominent people of Ammon. 42 He shall stretch out his hand against the countries, and the land of Egypt shall not escape. (Daniel 11:40-42, NKJV). The comments and actions from Saudi Arabia’s Crown Prince confirm that it is possible, and that changes can occur quickly. But Saudi Arabia’s Crown Prince Mohammed bin Salman is NOT the “prince” of Daniel 9:26 who will become the King of the North as shown in Daniel 11:31. Properly understood biblical prophecies are coming to pass–do not let anyone deceive you. This entry was posted on Tuesday, April 3rd, 2018 at 5:30 am	and is filed under Prophecy.